Is Cone Heads 8020 a “pet friendly” restaurant? 1.) Staff Productivity and Safety. During the year, it is not uncommon for our staff to be hindered from their work due to certain pets–due to being overly excited, somewhat aggressive, very protective, etc–making it difficult for our staff to get close to the proximity of the pet owner(s) to either retrieve their orders or to serve their food. 3.) Unsanitary Conditions. At times, pet owners have allowed their pets to relieve themselves on our porches, cement slab and surrounding property. Unfortunately, at times, some pet owners do not clean up their pet’s waste which results in our staff having to dispose of it. Also, this has occurred in the view of other guests dining, which is certainly not conducive to enjoying a meal. Can our guests dine in swimsuits, shirtless, etc? Because we are a family friendly restaurant and for sanitary reasons, we request that our guests please wear some type of shirt and regular shorts, board shorts, skirts, pants, etc before they enter Cone Heads 8020 to dine. 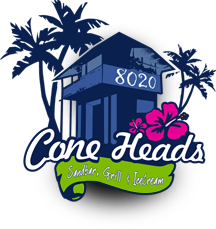 Is Cone Heads 8020’s seafood local? Shrimp: Our shrimp is some of the freshest on the planet harvested directly out of the Gulf of Mexico and delivered daily to our restaurant. Oysters: For years, our oysters came straight from the Apalachicola River. However, due to the BP Oil Spill and other convoluted legal matters pertaining to the states of Florida, Georgia and Alabama, Apalachicola oysters are not available at this time. Currently, our oysters are arriving from either Louisiana or Texas. Scallops: Commercial harvesting of scallops from our local St. Joseph Bay—or any Bay in Florida for that matter—has been illegal since 1994. Our scallops are bay scallops but they are not taken from St. Joseph Bay. Does Cone Heads 8020 offer gluten free ice cream? Cone Heads 8020 offers a variety of ice creams that are acceptable for those desiring to avoid gluten. Our website contains a list of ice creams that are acceptable for those desiring to avoid gluten. Does Cone Heads 8020 offer dairy free ice cream? Does Cone Heads 8020 accept reservations? No. We operate on a first come first serve basis. Why does Cone Heads 8020’s hours differ throughout the year? Because of the seasonal nature of the businesses on the Gulf Coast, during Spring and Summer our hours of operation are much longer than when we enter the “off-season” of Fall and Winter. Please check our Facebook page and website for updated hours of operation during the off-season. Can someone purchase Cone Heads 8020’s merchandise online? Yes! Almost all of our merchandise can be securely purchased online at our website and by clicking on “Shop”. What forms of payment does Cone Heads 8020 accept? That depends on where the purchase is being made. For purchases being made when visiting Cone Heads 8020, we accept cash, Visa, MasterCard and Discover. We do not accept American Express at our restaurant. We only accept checks from those who live in the local area. However, merchandise may be purchased online using Visa, MasterCard, Discover and American Express. Does Cone Heads 8020 deliver?